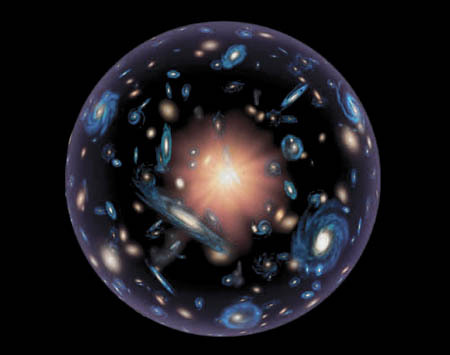 The universe we live in is finite, not only is it expanding, but its rate of expansion is increasing. According to the Masters of Light, the edge of the universe is at more than 13.7 billion light-years away. Rovanor: I’m glad to be here. I want to express a brief introduction. We, as superphysical entities, permanently incorporate knowledge, but there is a somewhat trivial statement that says: "there is knowledge and knowledge." For example: I can be a century incorporating knowledge and experience, and that adds. However, suddenly, one incorporate unthinkable concepts and everything changes. The fact of conceiving with other Masters of Light and assimilate that there are other Creations makes one feel like -and this is not ego, but a way of defining- insignificant. The embodied human being, at least in this tiny planet, has a very little idea of what the universe is. It’s true that you can find books and talk about the measure of galaxies, but they are only numbers like 100.000 (hundred thousand) light years, 1,000,000 (one million) light years, etc. With the Masters I'm learning that the universe, right now, surpasses more than 81 billion (eighty-one billion) light years... And the greatest scientists of the twentieth-century said that it was not possible to exceed the speed of light. So the question is - and I’m not going to answer it, but I’ll leave it as an open question- How can you explain, then, that if the universe is 13.7 billion years old today, has 81 billion (eighty one billion) light-years of extension? It’s expanded nearly six times the speed of light? Yes, and it’s accelerating even for billions of light years away. And these concepts that the exalted Masters have investigated, leave us marveled. Interlocutor: Okay. That’s the vastness of the universe, right? It’s unreachable for our understanding. And I presume that at a spiritual level, it also has understanding, right? Rovanor: One more thing about the Chaos (1): Many Masters have put forward whether a spirit can die- in accordance with the knowledge you all have about death- and it was said that not until we merge with the Creator and we all be one with him again. And instead of our consciousness disappears, we all will add it in a total Unit, which is the Creator. Interlocutor: Is this a new concept? Rovanor: This concept is new. The beloved Master Johnakan Ur-El dictated to me. Although a spirit does not die in the way you understand, that spirits is out of the Father’s presence. Interlocutor: Perhaps as if the spirit were trapped in a different habitat? Rovanor: Exactly. It is not easy to convey that. I send all my Love to you. So long. Interlocutor: So long, thank you very much for all your concepts, Rovanor. (2) Journey to the edge of the universe. This entry was posted at Sunday, July 24, 2011 and is filed under Cosmology, Paradigms . You can follow any responses to this entry through the .